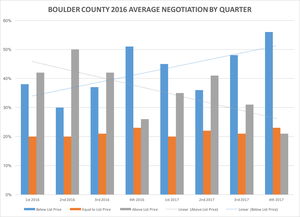 In 2017, Boulder Real Estate Negotiation Tipped Toward Buyers | Kearney Realty Co. In 2017 in Boulder County, the average negotiation off of list price for all sales was 1.3%. In 2016 it was .36%. However, when you look at it more closely both over time and across price ranges there are some good market insights. The chart below shows the sales in each of the last four quarters separated into three categories; those that sold for below the list price (blue), those that sold for exactly list price (orange), and those that sold for above list price (grey). As an example, let’s look at the second quarter of 2016 which is the second group from the left. During that quarter Boulder County was ranked #1 in the nation for appreciation by FHFA.gov. During the quarter, 30% of the sales went for less than the asking price, 20% went for exactly the list price and 50% of the sales sold for a price in excess of the asking price. This past quarter 56% sold for less than list price, 23% went for exactly asking price and 21% went for above the list price. The overall take away is that buyers have gained some traction in negotiations. There are two trend lines that intersect. The upward trending blue line represents the trend of properties selling below the asking price. The downward trending grey line shows the trend for homes selling at a premium. Homes that sold for $500,000 or less sold for .9% above list price. Homes that sold between $500,000 and $1,000,000 sold for .4% above list price. Homes that sold between $1,000,000 and $2,000,000 sold for 2.75% below list price. Homes that sold for prices above $2,000,000 sold for 4.17% below list price. The bottom line is that if you are buying a house in the entry level of any of the Boulder County communities you won’t have much wiggle room on price. If you are in the market for a home in the luxury range you will have much more room for negotiation. Don’t be fooled by averages.